Xiphoid Dementia have been around for quite a few years it seems (…since 1999 accordingly to the promo blurb), yet this is my first introduction to the solo project of Egan Budd. ‘Secular Hymns’ is evidently his second official album, yet based on the myriad of tonal aspects covered herein I am finding it rather difficult to pin down some words to describe it. This comment however is not intended as a negative, as by ignoring genre ‘rules’ Xiphoid Dementia have effectively turned any preconceived expectations I might have had on their head and produced a complex and striking album in the process. Likewise with the varied and multi-faceted sound of each composition which runs the gamut of multiple genres, it is akin to having multiple tracks within the lager compositional structure. On the other hand to provide an overly clinical description, ‘Secular Hymns’ blends aspects of noise, industrial, dark ambient and power electronics across four tracks of extended length (10-14 minutes each). Although the album commences calmly, the droning melodies and choir vocals of ‘Abortion Rites’, are soon enveloped by harsh, blasting, free-form noise (…let’s call this a positive pairing of dark ambient and industrial noise). Yet the opening track does not remain solely in a noise guise, instead edges into a loose power electronics arrangement complete with heavily treated vocals. Within its roughly hewn industrial soundscape the second composition ‘My Time Will Never Come’ presents a vague tribal / experimental character, which mid track falls away into a section of meditative synth melodies and further punctuated by metallic echoes and the tolling of a lone church bell. In a further display of the album’s bipolar tendencies, ‘What We Believe’ heads off on a totally different tangent, starting as a loosely structured experimental / ambient track, gradually building into a harder edged industrial noise and pulsing power electronics piece. Likewise based on its harsh overloaded bass/ noise production and further use of sampled dialogue, this track is not too far from the lauded sound of Propergol. For the final of the four tracks ‘Breathe’ commences as a slab of droning, viscous dark ambience that gradually morphs towards death industrial aura through the introduction of sporadic jagged tonal aspects catatonic bass heavy beat and distortion scarred vocals, making this track a focused and passionate ending to a solid album. With the variation in sound and strong disregard for established genre boundaries, this attitude (along with a few of the calmer dark ambient moments), brings to mind the early works of BJ Nilsen (aka the final Morthound album ‘The Goddess Who Could Make The Ugly World Beautiful’, and to a lesser degree the first Hazard album ‘Lech’), which is high praise from my perspective. 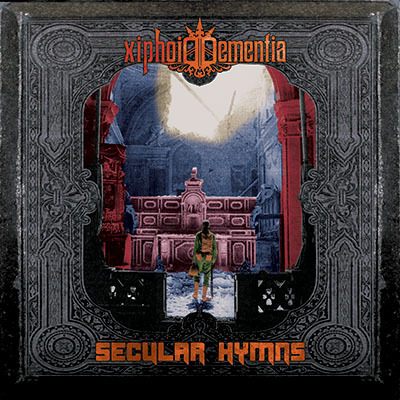 Likewise with its varied and complex scope and the finesse and confidence in which the material is delivered, Xiphoid Dementia is yet another excellent addition to the Malignant Records roster. This entry was posted in 2012, dark ambient, death industrial, experimental, industrial, Malignant Records, noise, power electronics by noisereceptor. Bookmark the permalink.